China’s Water Sharing Treaties – Reciprocity In Practice? 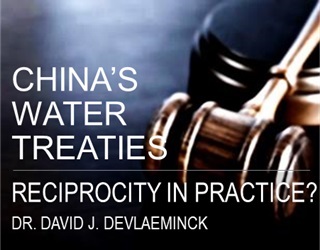 This contribution is based on Dr. Devlaeminck’s article “The Legal Principle of Reciprocity and China’s Water Treaty Practice” from the Chinese Journal of Environmental Law, Vol. 2, Issue 2. China has achieved astonishing development over the past decades, lifting millions out of poverty and becoming the world’s second largest economy. As the region develops and as the changes to our climate grow ever more serious, however, there are significant concerns that this growth cannot be sustained. This is particularly evident in the Hindu Kush Himalaya (HKH) region, as increasing temperature is melting glaciers and reducing snowfall, impacting the flow of China’s domestic and shared rivers. China is in a hydrologically important position in Asia sharing over 40 surface waters and over 20 transboundary aquifers with its 17 riparian neighbours, some of which have been described as hotspots for conflict. China, often upstream on these shared waters, aspires to be the good neighbour, increasing and enhancing regional partnerships for mutual benefit. Its reputation on its transboundary waters, however, faces significant misunderstandings and misperceptions, with some even referring to China as an “upstream controller” of water who is “stealthily waging a water war”. In spite of these perceptions, China is party to approximately 50 water or water-related agreements with its neighbours. These agreements, however, are often vague and follow a “one-country, one-treaty” approach. 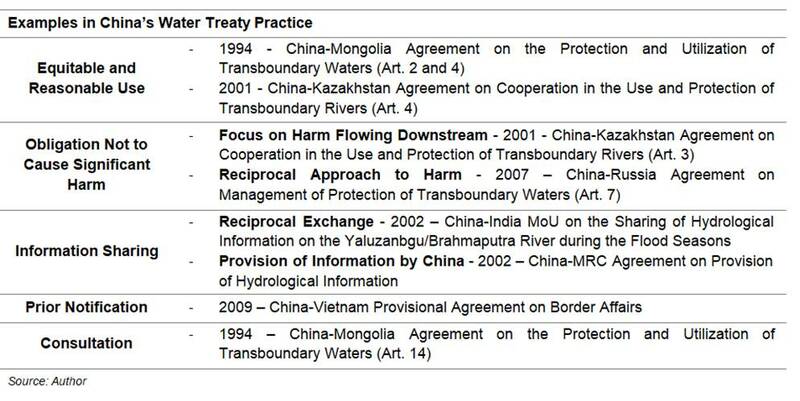 What is legal reciprocity and what does it mean for transboundary waters? Considerations of reciprocity play a large role in human and state cooperation and have been adopted and supplanted in domestic and international law in both bilateral and multilateral agreements, ensuring the right of one is the duty of the other and providing a sense of balance and fairness. Although reciprocity is more prevalent in areas such as humanitarian and economic law, reciprocity also plays a large role in international water law (IWL). In 1997 the UN General Assembly voted on the UN Convention on the Law of the Non-navigational Uses of International Watercourses, (UNWC) which, after ratification by Vietnam, came into force in 2014. China, citing a lack of consensus, the need for a focus on sovereignty, disapproval of various dispute settlement mechanisms and an imbalance in the rules of the Convention, was one of three countries that voted against it. Even though China perceived the rules to be imbalanced, a closer look at the UNWC via reciprocity illustrates that the substantive and procedural rules within protect both the interests of China and its downstream neighbours without favouring either. The foundation of the Convention lies in two of its primary rules, the principle of equitable and reasonable use (UNWC Art. 5 & 6) and the obligation not to cause significant harm (UNWC, Art. 7). Whereas upstream states preferred the principle of equitable and reasonable use, downstream states preferred the principle of no-significant harm, both perceiving them to protect their interests. Equitable and reasonable use, however, provides all states, upstream or downstream, with the equal right to utilise, but also the obligation to do so equitably and reasonably. The obligation not to cause significant harm protects both upstream and downstream states from significant harm, although from different kinds of harm. Whereas the substantive rules indicate what is to be achieved, the procedural rules, including information sharing, prior notification and consultation, provide the tools to get there. These rules include a reciprocal exchange of information and a reciprocal obligation of notification followed by a back-and-forth consultation process. China’s water treaties reflect the reciprocal aspects of IWL, illustrating that in some way China believes in and adheres to IWL principles. For example, China adheres to the principle of equitable and reasonable use in select treaties, expressed using terms ensuring its reciprocal application such as “fair”, “equitable” and “rational”. The obligation not to cause significant harm often takes a broad, reciprocal approach protecting both upstream and downstream states, however some of China’s treaties provide a narrow definition, focusing on kinds of harm that primarily effect downstream states, potentially being more burdensome for China. Furthermore, China engages in reciprocal information sharing, but also unilaterally provides information to some of its southern neighbours, an endeavour that could build trust. Select treaties also provide for prior notification and consultation, a reciprocal process of back and forth exchange. Although cooperation on its north and west is developed there is room for increased cooperation between China and its southern neighbours. China is moving forward with cooperation as evidenced by the newly formed, China-led Lancang-Mekong Cooperation Mechanism, including all Lancang-Mekong riparians. Although the legal status its commitments is unclear, future reinforcement through legal obligations is possible if the parties wish. In many ways this mechanism reflects IWL, with hints of the substantive rules and various aspects of the procedural rules. “When big rivers have water, small rivers are full. When small rivers have water, big rivers are full.” This Chinese phrase, quoted by President Xi Jinping at the 2015 Boao Forum highlights China’s message of cooperation and interconnectivity between China and its neighbours. Only together can they achieve their goals. In order to jointly meet these goals, however, China and its neighbours will need to follow a reciprocal approach, one that is firmly established in the global water conventions. Given that they have the ability to represent the interests of China and its neighbours, provide legal clarity in the interpretation of China’s water treaties and build trust in the region, China may want to consider taking a second look at these global conventions. Welcome To China’s Zero Waste Cities – China Water Risk’s Yuanchao Xu unpacks China’s new zero waste city initiative – can it save China’s cities from being ‘surrounding by garbage’? Which cities e.g. Greater Bay Area will become pilots? Dr. David J Devlaeminck is Lecturer at the School of Law, Chongqing University. His research focuses on the law of international watercourses and China’s transboundary waters, specifically on the role that reciprocity plays in legal cooperation on transboundary waters in China and across the world. India’s Water Policies: Just Feel Good Documents?